Our product range includes a wide range of Air Compressors such as High Pressure Compressor, Single Stage Compressor, Two Stage Heavy Duty Compressor, Multistage High Pressure Compressor and Vertical Type Air Compressors. Features: - Multi stage high pressure air compressors are designed for high pressure operations up to 70kg / cm2. - These air compressors frames have large oil capacity to assure low bearing temperatures & adequate lubrication for long periods . These all air compressors are having centrifugal unloaded to prevent starting under load. - These air compressors are ideal for a variety of application in different industries such as air blast, diesel generator starting by compressed air , circuit breaking , valve & system checking , laboratory test work etc. Multi stage high pressure air compressors are designed for high pressure operations up to 70kg / cm2. These air compressors frames have large oil capacity to assure low bearing temperatures & adequate lubrication for long periods . These all air compressors are having centrifugal unloaded to prevent starting under load. These air compressors are ideal for a variety of application in different industries such as air blast, diesel generator starting by compressed air , circuit breaking,valve & system checking , laboratory test work etc. 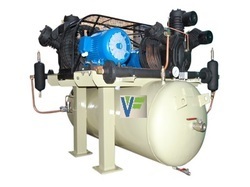 Looking for Multistage Air Compressor ?